This past month, while reading through several different German cookbooks written around the 16th century, I kept stumbling across this dish for roast peas. 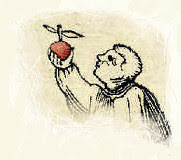 Though each recipe had it's differences, the main similarity was that they all began with the boiling of the peas and ended with the roasting of the peas. Given that recipes that stated fresh peas were used as they came fresh from the pod, I image that these were dried from the storage. It makes sense too, that people would try to come up with something interesting to do with these peas that was just eating up a boiled mass! The basic set of instructions are basically thus: Take you clean peas, boil and strain them, add many eggs to them, fry them in fat and then roast them on a spit. Only noticed one that skipped the frying part and suggested thickening them with grated bread before roasting them. What I chose to do was to stick with the seemingly popular boil, strain, fry and roast version though even here, we had variances. With my first batch, I used about the same weight in eggs and then fried them. 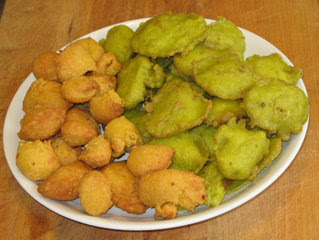 What resulted was very fluffy pancake type things, much like the green ones in the picture. In the second batch I used dried green peas for some variety, however they held more moisture which may have effect the end result after frying. In this batch, I used a more yolk heavy mixture in hopes of using less eggs since all of the of the recipes did not specify yolks. This too came out much like the first batch. With the third batch, (yellow) I used about half of it's dry weight in yolks only and these came out nearly round and fluffy. Somewhere in the midst of all of this, I did try these just fried and thought them not so bad so decided to bake some just as is, and it did improve them somewhat... for one, allowing more fat to drip out and allow it to crisp up. They may have, or might not have, done this in the period but it was worth a try. In the end though, it is supposed to be a roasted item that can be put up on a spit and basted... some say with fat and others egg yolk. I chose egg yolk as there was fat enough and figured the egg yolk would also help contain and hold the 'roast' together. This was made from 'mostly cooked' fried peas I made while making up the ones above, and while making that, decided to give it a whirl with some fully cooked (green) peas to compare. 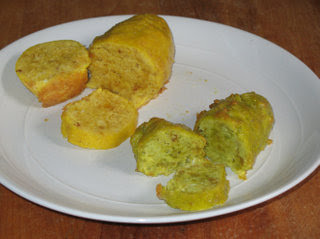 Apart from how it looked and how badly the green loaf/roast held together, even with the addition of a yolk, the texture remained fairly equal to the yellow. Of course, all is not perfect and there won't be access to a fire until the spring so it was baked in an oven instead of roasted by a fire, but was still pleased with the outcome of these mini-versions of the Roast Peas.